A major European petrochemical manufacturer is taking steps to begin importing ethane from the United States this year. 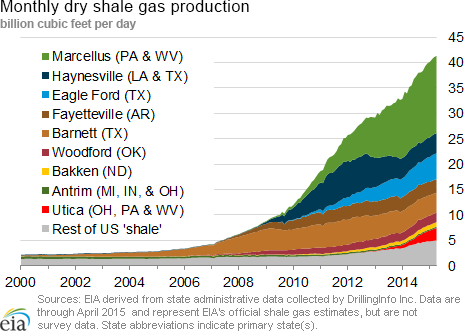 Over the past several years, ethane production in the United States has been increasing, from 869,000 barrels per day (b/d) 2010, to 1,081,000 b/d in March 2015. In addition, U.S. ethane prices have declined compared with other fuels. In recent years, the growth in production has spurred ethane pipeline exports to Canada and investment in the domestic petrochemical industry. And now, one of Europe's largest petrochemical companies, Ineos Olefins & Polymers, headquartered in Switzerland, is close to completing the first transoceanic ethane shipment from the United States. On May 28, Ineos Olefins & Polymers Europe, with ethylene cracker operations in Scotland and Norway, and its partner Evergas, a company specializing in seaborne petrochemical and liquid gas transportation, took delivery of the first ship in a planned eight-vessel fleet of Large Gas Carriers (LGC). These vessels will primarily transport ethane produced in the Marcellus and Utica shale plays to Europe from the Mariner East project/Marcus Hook Industrial Center in Pennsylvania, under a 15-year contract between Ineos-Europe and Evergas. 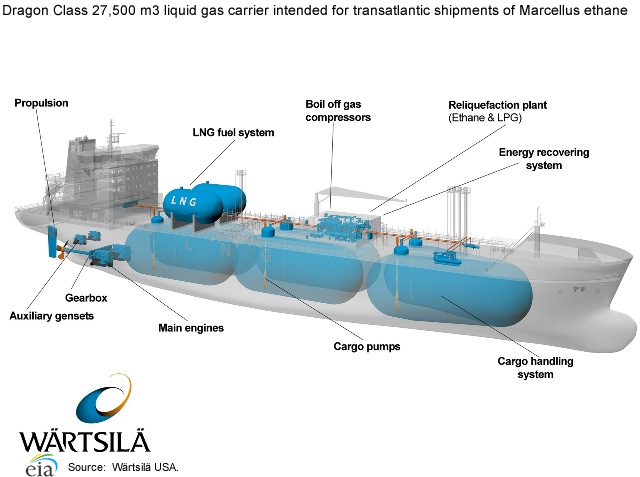 Though designed and constructed for transoceanic shipment of ethane, the ships will be capable of transporting other hydrocarbon gas liquids (HGL), as well as liquefied natural gas (LNG). These ships measure 591 feet (ft) long, 87 ft wide, and have a draft of 30 ft. They are the largest ethane carriers in production to date and have a rated capacity of 971,162 cubic feet, or 175,000 barrels. These ships are designated as the Dragon class, and are identified by Evergas as among the most technologically advanced liquid gas carriers on the seas today. Manufactured by Sinopacific Offshore & Engineering, a shipyard in China, these LGCs use LNG for propulsion and cargo handling, systems supplied by Wärtsilä, a Finnish manufacturer, to optimize performance for ship's systems and cargo management. Ineos Europe was the first European company to contract for ethane feedstock from the United States. In 2012, Ineos contracted with a Marcellus-based supplier, Range Resources, for ethane, and with Sunoco Logistics for the associated transportation capacity on the Mariner East project that would move the ethane east from the Appalachian Basin for transatlantic shipment. As an anchor shipper, Range Resources has firm transportation of 40,000 b/d (20,000 b/d ethane, 20,000 b/d propane), and will have storage capability for both ethane and propane at Marcus Hook. The Marcus Hook Industrial Complex, located along the Delaware River south of Philadelphia, Pennsylvania, was formerly a Sunoco refinery and is now being used as a terminal and dock facility. It is operated by Sunoco Logistics Partners, with additional hydrocarbon gas liquids (HGL) related manufacturing, including a planned propane dehydrogenation plant. 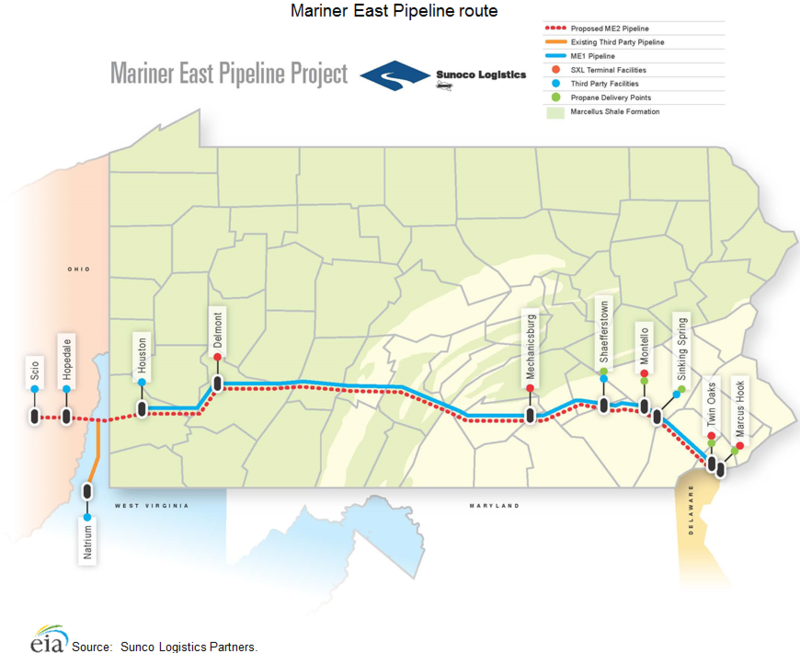 The Mariner East 1 and Mariner East 2 pipeline projects are designed to deliver HGL from the Marcellus and Utica shale areas in western Pennsylvania, West Virginia, and eastern Ohio to Marcus Hook. Mariner East 1 began operations in fourth-quarter 2014, delivering propane to Marcus Hook, and is scheduled to be fully operational for delivering up to 70,000 b/d of propane and ethane in the second half of 2015. Mariner East 2 is expected to begin operations in fourth-quarter 2016 with an initial capacity of 275,000 b/d for both domestic and international customers. With the first Dragon class vessel entering operation next month, and Ineos upgrading its ethane terminal in Rafnes, Norway, to handle these ships starting in mid-to-late 2015, ethane shipments from Marcus Hook to Europe are expected to start during the second half of 2015. Prices of natural gas at most market locations increased over the report week (Wednesday, June 3, through Wednesday, June 10). The Henry Hub spot price began the week at $2.64/million British thermal units (MMBtu) last Wednesday and ended the week at $2.92/ MMBtu. At the New York Mercantile Exchange (Nymex), the July contract rose from $2.634/ MMBtu to $2.891/MMBtu yesterday. Working natural gas in storage increased to 2,344 billion cubic feet (Bcf) as of Friday, June 5. A net injection into storage of 111 Bcf for the week resulted in storage 47.3% above a year ago and 1.9% above the five-year average for this week. The total oil and natural gas rig count fell by 7 units to 868 for the week ending Friday, June 5, according to data from Baker Hughes Incorporated. The oil rig count fell by 4 active rigs, to 642, in its 26th consecutive week of declines. The natural gas rig count fell by 3, and now totals 222. The natural gas plant liquids composite price at Mont Belvieu increased sharply, rising by 35¢ to $4.88/MMBtu for the week ending June 5. 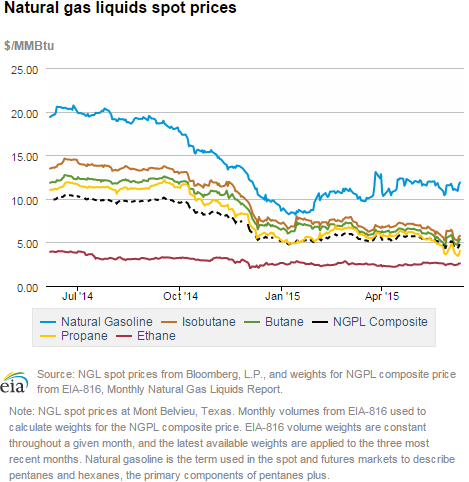 Every natural gas liquids product except ethane saw large spot price increases. Mont Belvieu spot prices for propane, butane, isobutane, and natural gasoline all increased by between 36¢ and 56¢/MMBtu, in contrast with ethane, which rose by just 2¢/MMBtu. Prices started the week relatively low, likely because of flooding in Texas combined with already-high levels of NGL stocks. Prices rise on hotter weather and flat supply. Natural gas prices increased in all spot market locations this report period, led by hotter weather, which drove up demand in the electric-power sector, and flat supply. 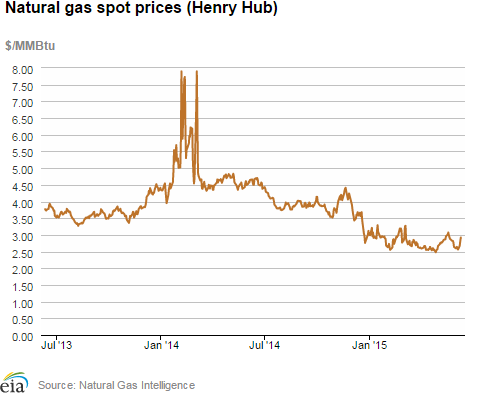 The Henry Hub spot price began the week at $2.64/MMBtu and settled yesterday at $2.92/MMBtu. Prices at most trading locations rose by 25¢ to 40¢/MMBtu. The Chicago Citygate price rose by 27¢ to close at $2.85/MMBtu yesterday. The PG&E Citygate price, which serves Northern California, similarly rose by 27¢, closing at $3.25/MMBtu yesterday. Northeast prices jump sharply. The biggest absolute and percentage spot price increases occurred in the Northeast, where some prices rose by more than $1.00 and some doubled or nearly doubled. It is worth noting that price points in the region generally began the report period depressed, with a few of them closing below $1.00/MMBtu last week. Most of the price increases came Tuesday and yesterday on the arrival of higher temperatures. The Algonquin Citygate price, serving Boston, increased by $1.83 over the week, and closed at $3.13/MMBtu yesterday. 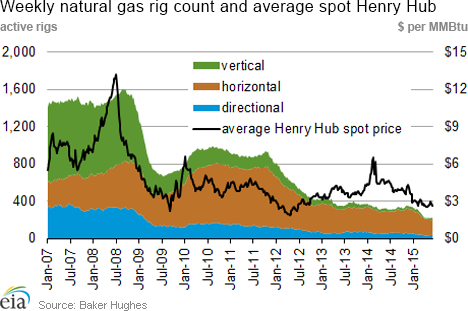 Marcellus prices strengthened as well. Tennessee Zone 4 Marcellus rose by 28¢, closing at $1.26/MMBtu yesterday. Some traders also cited forecasts of moderating productivity as a driver of prices. Nymex prices rise. At the New York Mercantile Exchange (Nymex), the July contract began the week at $2.634/MMBtu and rose by more than a quarter to close at $2.891/MMBtu yesterday. The 12-month strip, which averages the July 2015 through June 2016 Nymex prices, closed at $3.112/MMBtu yesterday, about 19¢ above the Henry Hub spot price that day. 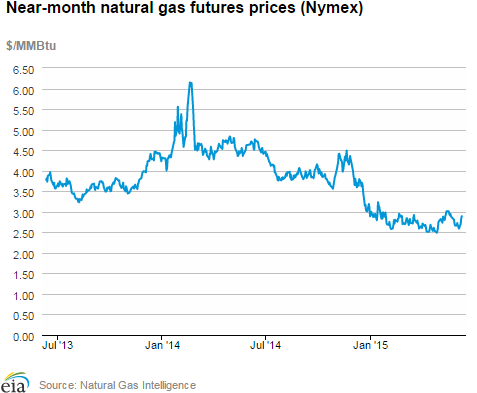 Most natural gas liquids prices rise sharply. The natural gas plant liquids composite price at Mont Belvieu, Texas, rose sharply, returning to levels similar to two weeks ago. Possibly because of flooding in Texas, last week's Mont Belvieu NGL spot prices fell significantly, with the exception of ethane, which remained relatively flat. NGL prices have been low in recent months because of a combination of factors: high production, high storage levels, slack in export markets, and low crude oil prices. Supply and production are flat this week. Dry gas production was essentially flat this week, rising by 0.1% and averaging 72.0 Bcf/d, according to Bentek Energy data, about 5.9% higher than last year's levels. Imports of natural gas from Canada rose by 2.4%, with receipts in the West and Midwest increasing, and receipts in the Northeast decreasing. Overall supply increased by just 0.2%. 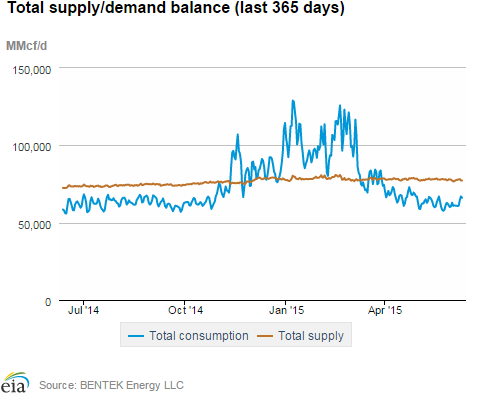 Demand continues to increase, led by power generation. Overall U.S. gas consumption increased by 3.1% this week, with large increases in power-sector demand offsetting continued declines in other sectors. Power burn increased in almost all regions, with generators in the Midcontinent region consuming 76.9% more natural gas this week than last week, and Texas consuming 23.3% more. The Northeast was the only region showing a week-on-week decline, falling by 1.4%. U.S. residential/commercial demand fell by 9.5%, and industrial demand was relatively flat, falling by 0.7%. Exports to Mexico decreased by 3.2%. Increase over five-year average grows. The net injection reported for the week ending June 5 was 111 Bcf, down from 132 Bcf the previous week, But more than the five-year average net increase of 89 Bcf for the week and last year's net increase of 109 Bcf. Working gas inventories for the storage week totaled 2,344 Bcf, 753 Bcf (47.3%) higher than last year at this time and 44 Bcf (1.9%) higher than the five-year (2010-14) average. Storage injections were in line with market expectations. Market expectations, on average, called for a build of 113 Bcf. When the EIA storage report was released at 10:30 a.m. on June 11, the price for the July natural gas futures contract fluctuated modestly and eventually stabilized at about $2.88/MMBtu in trading on the Nymex, very close to where prices were prior to the release. From the week ending April 3 (the beginning of the injection season) through the week ending June 5, net storage injections totaled 883 Bcf, or 16% more than the 758 Bcf injected during the same ten weeks in 2014. During these weeks for the years 2010 to 2014, net injection into storage averaged 651 Bcf. The estimated average unit value of the natural gas storage holders put into storage from April 3 to June 5 this year is $2.73/MMBtu, 41% lower than the average value of $4.60/MMBtu for the same nine weeks last year. The highest winter-month Nymex price (for the January 2016 contract) in trading for the week ending June 5 averaged $3.13/MMBtu. This price is 49¢/MMBtu more than the July Nymex contract price. A year ago, the difference was 9¢/MMBtu, suggesting there is more financial incentive this year to buy and store natural gas in the summer for sale in the winter. In the Short-Term Energy Outlook released on June 9, EIA forecasts that end-of-October inventories will reach 3,912 Bcf, 115 Bcf above the five-year average for that time. There are currently 21 more weeks in the injection season, which traditionally runs from April 1 through October 31, although in many years injections continue into November. In order to reach 3,912 Bcf, injections need to average 75 Bcf per week through the end of October. EIA's forecast for the end-of-October inventory level is above the five-year (2010-14) average peak storage value of 3,805 Bcf. To reach the five-year average peak value, average weekly injections through the end of October would need to be 70 Bcf. Temperatures during the storage report week near normal. Temperatures in the Lower 48 states averaged 66.9° Fahrenheit for the storage report week, 0.3° cooler than the 30-year normal temperature and 3.1° cooler than the average temperature during the same week last year. There were 21 population-weighted heating degree days (HDD) during the storage report week, 11 HDD more than the five-year average and 13 HDD more than during the same period last year. There were also 34 population-weighted cooling degree days (CDD) this report week, 16 CDD fewer than the five-year average and 9 CDD fewer than during this week last year.